It’s no secret that a bathroom renovation is one of the best ways to increase the value of your property. A modern and functional bathroom enhances every home. If your bathroom is starting to show the signs of wear and tear, or if the design and fittings have dated, maybe it’s time to renovate. But where to start? Unless you’ve got an unlimited budget to play with, it pays to do your research. Start with your objectives – why are you renovating? If your family structure has changed (new babies, children growing up, empty nesters), this is often a time to reassess the layout and contents of your bathroom. Or are you preparing your home for sale and want to maximise your value? What really has to change and what can’t you do without? These are key questions that will shape the scope of your project. The research phase is the time to look around – there are so many places where you can get ideas on the latest bathroom trends. Browse the internet, set up a Google alert, buy a magazine, watch one of the many renovations shows on TV. Inspiration is everywhere! How much can you afford to spend? This is a key part of planning. 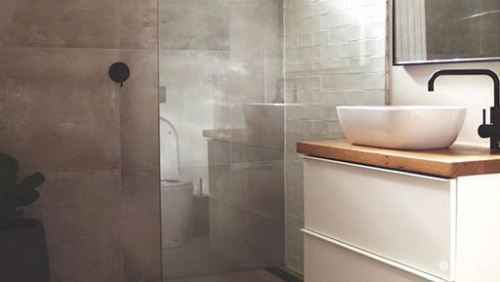 Bathroom renovations can range from under $5,000 to over $20,000 depending on the size of your room and the quality of materials, and the scope of building works. A general rule of thumb is to factor in a 20% buffer in your budget to cover you for unexpected problems during your renovation. You might not discover termite damage or dry rot problem until you remove a wall, or uncovering your plumbing might reveal that it no longer complies with the current building standards. It’s the “be prepared” motto. Factor these possibilities into your budget to avoid major headaches as you progress through your renovation project. Renovating or remodelling? Are you looking to just make cosmetic changes or are you envisaging a whole new layout? There are so many factors to consider in the overall design of your bathroom. Think about your storage needs, the effect of lights and tiling, the design implications of your fixtures and décor. Be wary of extreme trends as these can often date more quickly than classic styles. Start with measuring out your available room space to give you an overall view of your floor plan. Measure your wall lengths, door and window spaces. Accurately mark the position of your current plumbing fittings for your toilet, shower, bath and sink. Remember, if you choose to change the position of your plumbing fittings, this will add costs to your overall budget. You’ll need to engage the services of professional tradespeople for your bathroom renovation, including a plumber, electrician and tiler. Before engaging a trade, make sure that they’re the real deal by checking that they have a contractor licence endorsed on the Service NSW website. You’ll see that Bear Plumbing is proudly listed with the green tick! Installation of bathroom fixtures such as toilets, showers and sinks should never be a DIY undertaking. Just because you can buy it yourself at Bunnings doesn’t mean you should install it yourself. In fact, installing these items yourself could mean an insurance nightmare if you have problems down the track. The Bear Plumbing team has been involved in countless bathroom renovations for both residential and commercial clients over the years. If you follow our Facebook page, you’ll often see examples of our work – and our exclamations about how much we love working on them! We have a fantastic network of complementary trades who we’ve worked with on many projects and who we recommend, helping to make your bathroom renovation experience a smooth process with a result you’ll love. If you’re thinking about renovating your bathroom, give our team a call!